One of the most popular choices for window coverings in Texas, horizontal blinds at Houston Blinds For Less are both attractive and functional. Window blinds easily block light from entering a room, increase privacy, and enhance the beauty of a room. Offering the highest quality products in the industry, Houston Blinds For Less sells durable aluminum, wood and faux wood horizontal blinds for residential and commercial applications. 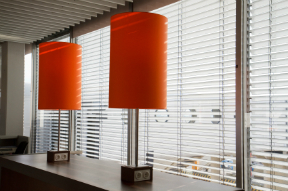 Horizontal blinds are ideal for any home or office window and offer versatility in function. You can easily control incoming sunlight and ventilation by tilting the slats or raising the blinds like shades to open them completely. Immediately lower the cost of cooling your home or office by closing blinds on a hot summer day you. Closing blinds will also block damaging UV rays and help protect your carpet and furniture from fading. In addition to functionality and usability, today’s horizontal blinds are aesthetically pleasing. A popular choice of window covering by many interior designers, horizontal blinds provide the perfect finishing touch to your home décor. Although standard horizontal blinds are easy to operate, you may prefer blinds with motorized operation for difficult to reach or large windows. Wireless remote controlled window blinds and automatic blinds on a programmable timer offer effortless control. Ask us about your options for motorized blinds at Houston Blinds For Less. 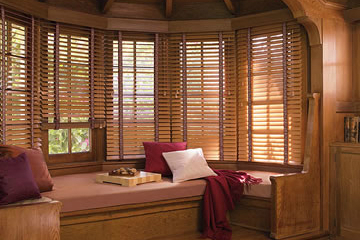 You will find a wide selection of wood, faux wood and aluminum horizontal blinds at Houston Blinds For Less. 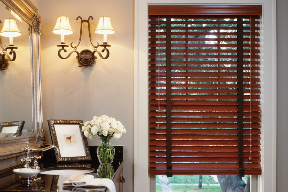 Wood blinds, a high-quality window covering for traditional or contemporary homes, are a popular selection. Faux wood blinds, also a popular choice, give you the look of real wood for less. Light-weight aluminum mini blinds are a good choice for offices, schools, store fronts, restaurants, and homes. Call (281) 997-2100 for more information about the best type of window coverings for your space or to learn more about your options for horizontal blinds at Houston Blinds For Less. We provide free consultations and can bring our showroom to your Greater Houston area home to assist you in making your window covering selections.